From the 1960 NASA archives comes a film showing the launch of an Atlas ICBM carrying a payload of research instruments at Cape Canaveral, Florida. The NASA film captures the rocket fire and lift-off as well as a shot of the engineers at some of the control stations. Terrific older film saved in the archives for today’s online audience. What can be the most satisfying aspect about history is its ability to right what has been wronged. The idea that time and a writer’s perseverance can fix what the present failed to do can be wholly satisfying. Let’s face it. Today we are only getting the partial truth. Sometimes it takes a journalist, author or researcher to uncover lost information and bring it forward above the layers of noise for all of us to see. It is satisfying to read how, through time and effort, someone’s reputation was repaired or another’s legacy was pulled down to into the valley from the mountain top. There are many examples of history making it right. The case of Capt. Charles McVay, Commander of the USS Indianapolis, is one of many. 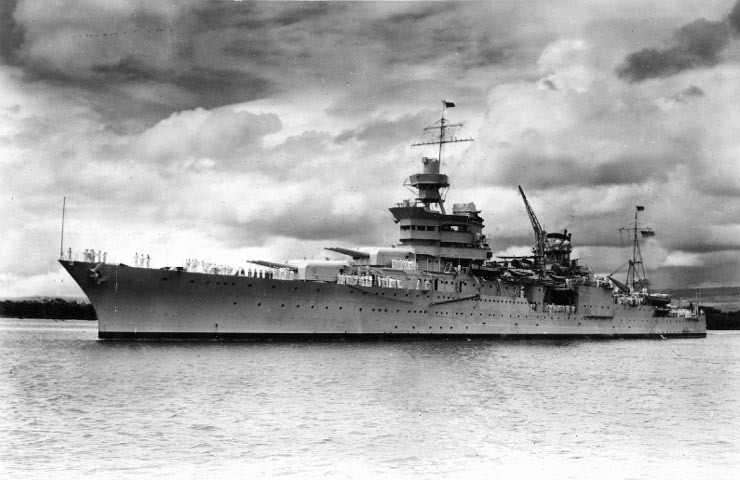 McVay’s USS Indianapolis was hit by two torpedoes after delivering cargo on Guam while sailing toward Leyte Island 1945. Several hundred crew went down with the ship while several hundred more of the 1196 souls lost their lives drifting in the water for several days due to hyperthermia, starvation and shark attacks before being rescued. Capt. McVay, after being one of the 317 rescued, was convicted by court-martial of “hazarding his ship by failing to zigzag.” Fleet Admiral Chester Nimitz remitted his sentence and restored him to active duty until his retirement in 1949. Nevertheless, this event haunted McVay for the rest of his life before committing suicide in 1968. Due to painstaking research and several supporters working for him, in 2000 The United States Congress and President Bill Clinton gave him his redemption and passed a resolution with Clinton signing it. The resolution states, “he is exonerated for the loss of Indianapolis.” In July 2001, the Secretary of the Navy ordered his record cleared of any wrong doing. It’s just one case of history correcting a wrong. Another case is President Gerald R. Ford. He pardoned former President Nixon on September 1974 for any criminal acts he may have committed while serving as President. At the time, this act was unpopular in many circles from the voting public to print and broadcast media companies and popular journalists. This decision probably was a major factor in costing Ford the 1976 election. However, history has a way of changing attitudes. In 2001, Ford received the JFK Profile in Courage award for making the controversial decision to pardon the former President. He said when receiving the award that “It was the state of the country’s health at home and around the world that worried me.” He seemed to know then what others seemed to comprehend many years later. The best medicine for the country was to move on. President Harry S. Truman left office with his approval rating low. His Gallup Poll approval rating was hovering in the high 20s and low 30s. With the passage of time and several authors writing biographies about his life and presidential term, his ranking lately has been in the top 5 listing of the best Presidents of all time. Not that Truman would much care about where he was on the scale. He was only interested in getting the job done. That’s why he called in former President Herbert Hoover to help with feeding the population of war-torn Europe after World War II. Hoover is another President whose reputation took a hit in the 1930s. Hoover came through for Truman then and became a valuable asset and information resource for Truman and other Presidents to follow until his death in 1964. These are just a few examples of change. History changes many things: Slavery, the Soviet Union, the Right to Vote, the creation of the State of Israel, Prohibition, the treatment of Native Americans and many others. What matters is, people do change and with that comes the correction of many wrongs, the condition of human foibles and the elimination of evil when needed. Sometimes, a book appears in stores or online that catches my eye. I know just by reading the book title that it will be a page turner or for some people a “finger swiper” on our digital readers. I have been reading the “The Presidents Club, Inside The World’s Most Exclusive Fraternity” for a few weeks now. With a length of more than 650 pages, I have been taking my time reading it. The book is well researched and written by Nancy Gibbs and Michael Duffy and published by Simon and Schuster. Nancy Gibbs is a graduate of Yale University and the University of Oxford. She is Managing Editor of Time Magazine. Michael Duffy is a graduate of Oberlin College. He is Washington Bureau Chief and Executive Editor for Time Magazine. Right from the first Chapter, they caught my attention and kept it all the way through. I actually read some chapters twice just to retain some of the information they revealed in the book. They discuss the history leading to the formation of the President’s Club but it begins to get interesting when they write about President Harry Truman asking for help from former President Herbert Hoover. The top Democrat asking for help from a Republican most democrats didn’t want to be associated with in any way. But President Truman was different. He knew how to use resources and Herbert Hoover was just the right guy to prevent starvation in Europe after World War II. There are many stories like this throughout the book. It travels through history covering all of the Presidents to the current sitting President Barack Obama and how they viewed the “Club” and, more importantly, how they used the members of the exclusive fraternity. I would recommend this book to any history scholar or presidential historian looking for a different perspective on the use of power. It might change your view on several Presidents and how they operated. After reading this book, I changed my opinion on a few Presidents. One President I gained even more respect for during the my reading, Harry Truman. One President the authors elevated his stature in my mind, Herbert Hoover. I knew that former President Richard Nixon was a diplomatic and foreign policy guru and the authors prove it in the book. The book also reveals how certain former Presidents can be difficult at the least. After reading the book, you can entertain your own conclusions.